Got a nagging feeling your current storage solution isn't quite up to par? 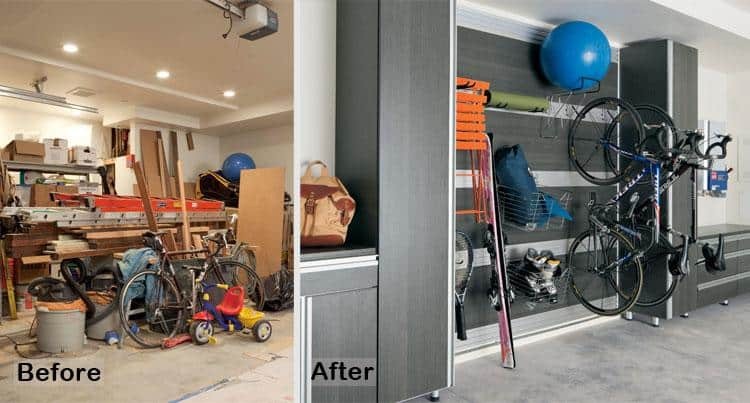 California Closets designer Sue Lashmore shares her disciplined approach to storage makeovers – maximizing every inch of space. Bringing clothes down to your child's height is vital. Not only do you create more space that way, it makes it so much easier to hang, fold and display clothes. 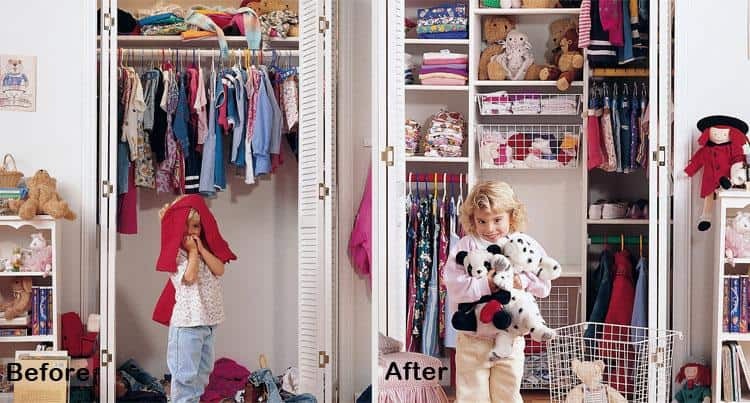 Having triple storage for toddlers’ small items with three hanging bars is another handy tip. You can then adjust to two bars as pants and coats grow longer. To help your kids find the items they'e looking for, add in some wire mesh baskets, which eventually you can swap for more drawers or more shelves, as needs change. Shelves trump drawers for folded items like sweaters and T-shirts says Lashmore. “In drawers you only see what’s on top. Shelves make it easier to manage personal inventory, because you can see everything you’ve got, including what you haven’t worn in a year.” Reserve drawers for hard-to-contain items like socks, underwear and lingerie. Extra tip: leaving open space above the closet, creates the illusion of a more spacious room. Rule of thumb for when placing an island in your dream walk-in: you must have at least 30 inches of clear space all the way around, says Lashmore. Since California Closets are custom-designed, built and installed, a professional scrutinizes devilish details like this to make sure every penny of your budget is well-spent. 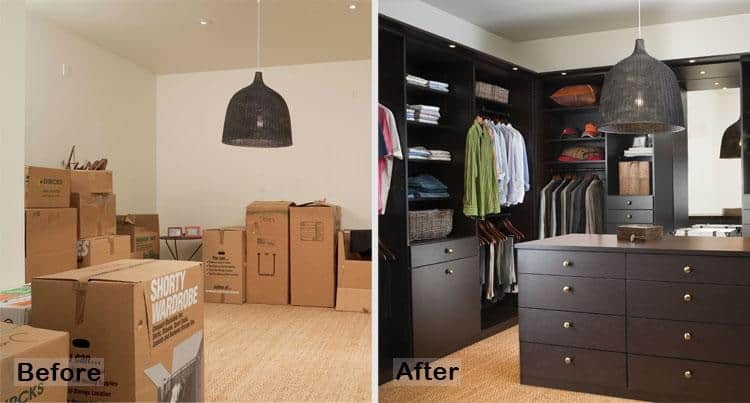 Not only does this luxurious dressing room feature accent lighting, the designer has also stacked hanging rods one over the other, so blouses and jackets don’t shadow accessories and other pretties in drawers. “Golden drawer pulls and dark wood cabinetry add to the rich feel,” says Lashmore. 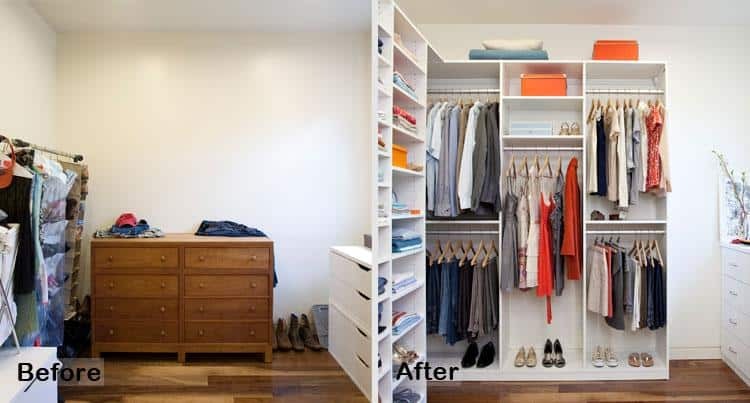 One of California Closets’ best illusions: more cupboards actually take up less visual space. 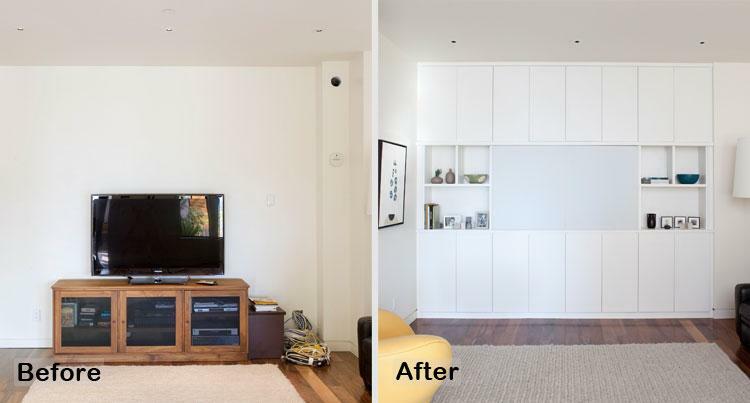 “Clean white and contemporary, these sleek touch-release cupboards tuck right into this narrow alcove,” Lashmore explains. Even the television is concealed by sliding matte Italian glass doors when screen time is over. “The garage is really the last frontier in home storage,” says Lashmore. “People are realizing it relieves stress when they don’t have to drive in and see that mess.” Combining fusion track strips with component hooks are the perfect solution for picking up awkward or oversized pieces. Here, a garden-hose hanger is the perfect resting spot for an exercise ball, large hooks hoist bikes off the floor and wire baskets hold helmets and safety pads. And for all the other small items, you can tuck those behind flat-faced cupboards. “Milano grey, one of our Italian finishes, is marvelous for the garage because it doesn’t show the dust and dirt.